I’ve never been a big burger fan, to put it lightly. For most of my life I flat out refused to eat them – except my dad’s: loaded with onions, topped with multiple Kraft singles and then I drowned the poor thing in ketchup. Hardly what most burger aficionados would consider appropriate. The thing is, I like my steaks very rare, “a cool center” for the steak lovers out there, and with most burger meats it’s just simply not safe to do that, so I swore burgers off my acceptable list of foods at a very young age. 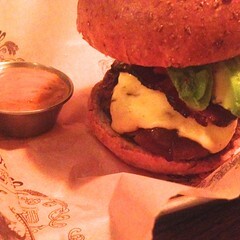 Bareburger is a New York City founded, tri-state area burger franchise. Currently with 16 locations and growing (Hoboken COMING SOON! 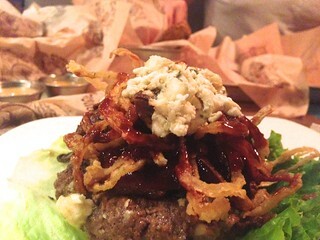 ), if you love a gourmet burger, you’re going to want to try to this place. Along with the mainstream beef and turkey, they craft burgers out of bison, ostrich, wild boar, elk and lamb. They also create drool-worthy sandwiches from grilled chicken, buttermilk battered chicken, black bean patties, quinoa or portobello mushrooms. Vegans and vegetarians are welcomed! And they have more than a few bread alternatives for those following a gluten-free diet, including a lettuce wrap and a tapioca rice bun. Recently my boyfriend, Nick, and I visited their only NJ location, at City Place on the Promenade in Edgewater. I was hoping to try ostrich, but unfortunately they were out of it, so we both opted for bison. The burger menu has a number of crafted combinations to choose from, or you can build your own. We both chose to go with one of the incredible combos: Me, a bison burger done rare with the Big Blue Bacon toppings (blue cheese, country bacon, fried onions, smokehouse sauce and and and bacon…wait for it…MARMALADE.) What? Amazing! Nick got the Roadhouse toppings: pepper jack cheese, country bacon, avocado, grilled onions, picante peppers and smoked paprika mayo. The burgers come alone – which is not to say you need a side, they are HUGE – but if you want to add a side there are so many to choose from. 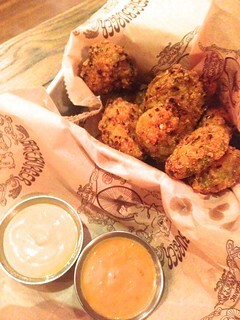 Fried pickles for me, and Nick tried the Parmesan panko crusted zucchini sticks. While I’m not a huge fan of bread-and-butter style pickles, the spicy crust did help balance out the sweetness. And the zucchini sticks were delicious and crunchy. Our burgers arrived right on schedule. Beautifully presented and smelling delicious. 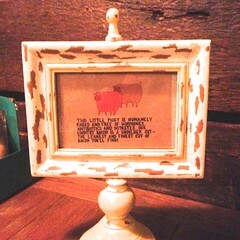 The bison was perfectly rare and incredibly delicious. We finished our burgers in record time. Stuffed and happy. The goal of Bareburger is simple: they are committed to using sustainable, eco-friendly materials in their restaurants with organic foods and reusable dishware and utensils. Along with their burgers, they serve salads, snacks, dips and cubby meals (for the little ones). We regretted not having enough room to try the recommended shakes or desserts, but that’s just another reason to come back. 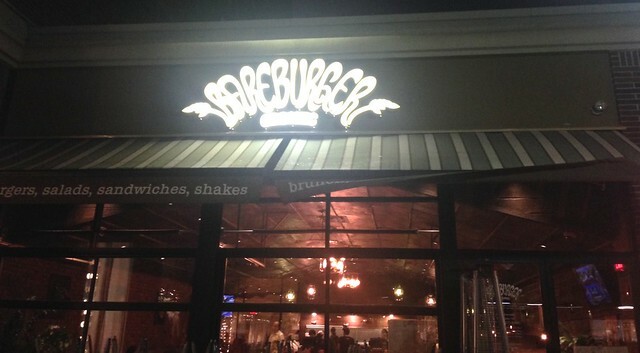 In honor of National Burger Month, I urge you to check out this place. It’s definitely worth the trip! Currently Edgewater is the only NJ location, but the Hoboken location will be opening soon! Karin Nastawa grew up in the great Garden State, leaving only briefly to attend college in Philadelphia, where she developed a love for all things cheesesteaks. She has lived in Hoboken for over nine years, taking in the incredible dining scenes on both sides of the river and has a particular affinity for staking out interesting BYO establishments in Hudson County. She is the founder and owner of VinEatsi, a boutique wine & food digital marketing agency and has also studied wine and spirits extensively, receiving her advanced degree from the Wine & Spirits Education Trust (WSET). Along with running VinEatsi, she is an avid cook and food enthusiast and writes about her wine & food adventures in the VinEatsi blog. She dreams of having a chef’s kitchen and a state-of-the-art wine cellar filled with Sonoma Coast Pinot Noir and Left Bank Bordeaux… someday.